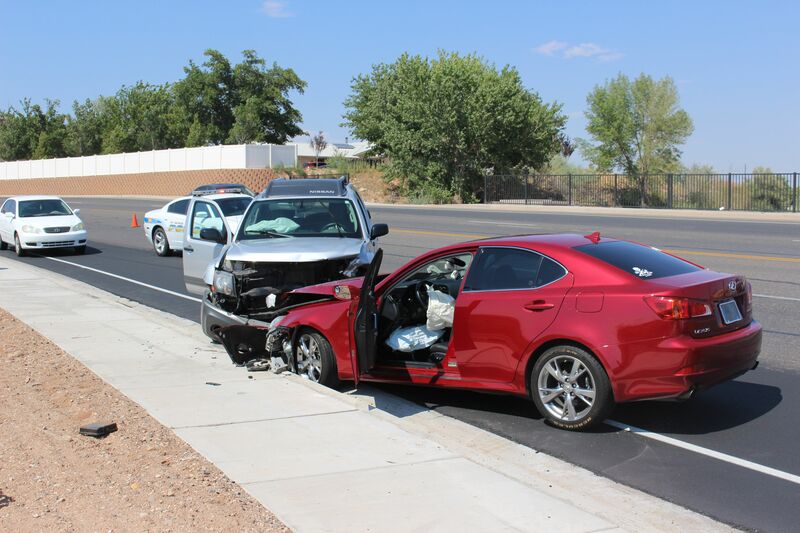 ST. GEORGE — A collision Wednesday afternoon on River Road left two cars severely damaged, but a police spokesman said the vehicle that caused the wreck did not get hit. “About 3:44 p.m. I was dispatched to a crash at 2800 River Road. I found two vehicles that had been involved in a collision,” St. George Police Officer Jamison Hale said. Those vehicles were a Lexus and a Nissan SUV. After speaking with the two drivers involved in the collision, Hale determined that a third driver – who was not part of the collision – had actually caused the crash. That driver was westbound on 2800 South and stopped at the stop sign waiting to turn left. Hale said the third driver, in a GMC pickup truck, had started to turn south on River Road when he saw the Lexus coming northbound and realized he did not have the power to maneuver across the intersection safely. The pickup driver stopped in the middle of the road, forcing the Lexus to swerve to the left over the center line, colliding practically head-on with the southbound Nissan SUV. Both the Lexus and the Nissan SUV ended up against the southbound curve, slowing traffic through the area for about 45 minutes. Hale added that the driver of the Lexus complained of right wrist and abdomen pain and was privately transported to Dixie Regional Medical Center in St. George by family members. The passenger in the Nissan SUV was reported to be bleeding from cuts on her leg and was taken to the hospital by Gold Cross Ambulance. Both the Lexus and Nissan SUV received major damage and were towed from the scene. The driver of the GMC pickup was cited for failure to yield after a stop sign, Hale said. Units from St. George Police and Fire departments and Gold Cross Ambulance were on the scene. My initial thoughts are had the lexus driver had his/her full attention on the road there would’ve been time to slow to a stop, or have a reduced speed collision with the pickup blocking traffic. Swerving to the left is a panic maneuver by a driver taken by surprise (likely by not paying attention) or a driver w/ very little experience or just a plain bad driver. Was the pickup driver 100% responsible? The cops apparently thought so. I’d say the other driver was a contributor.